and the first American to row across the Atlantic solo! NEW! !--FIRST WOMAN SOLO ROW ATLANTIC OCEAN--NEW!! (Sept,09,1998)--After spending more time at sea rowing solo than any woman in history (85 days); Tori Murden got literally thrashed by Hurricane Danielle. Her boat American Pearl was capsized numerous times and finally "pitch poled" end over end. With a body covered with bruises and an injured shoulder Tori was forced to set off her EPIRB and was rescued at sea having to abandon her boat (found off the coast of Portugal two months later intact!). 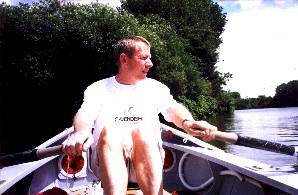 (May,27,1998)--The first woman to attempt to row an ocean solo, Peggy Bouchet has rowed the farthest (3248 miles) of any woman. After 79 days at sea and an exemplary crossing, Peggy Bouchet became victim of a capsize 120 miles from Guadeloupe. "I was closing the hatch when suddenly a very strong wave capsized the boat. Being trapped under the boat by my harness I was unable to breath and I thought that I was going to die..." Peggy was rescued and her boat was found off Puerto Rico (Peggy and boat are now back in France). These three rowers are part of the Sector No Limits Team. Sector Sport Watches supports the endeavours of extreme athletes to test the limits of human endurance. (June, 20,1999)Where's Koloss? Arnaud's boat should be arriving in the West Indies... Anyone seen it? DEC, 03,1998---CONGRATULATIONS TO ORS DIRECTOR KENNETH CRUTCHLOW AND TATIANA REZVAYA ON THEIR WEDDING!! Atlantic Endeavour is an expedition mounted by a Scottish-based team to set the world record for the fastest non-stop rowing of the Atlantic Ocean. The rowers will leave the Canary Islands in November bound for the West Indies on a voyage filled with discovery, danger and physical endurance. The Port St. Charles Rowing Race -Extensive site with maps, team information, and articles about the longest hardest rowing race in history. Thirty teams racing 3000 miles across the Atlantic. The only man to ever row the Atlantic in both directions solo. (Oct,26,1999)--"I arrived in Los Gigantes and realized almost immediately that it was too big a job. And rather than start and fail I simply decided not to go. The boat didn't touch the water. Now I'm going to have a nice holiday with my family." The Ocean Rowers... excerpts from a new book by Kenneth F Crutchlow & Steve Boga. Sidney Genders, Solo row of the Atlantic in three stages; England to the Canaries, to Antigua, to Miami Florida. 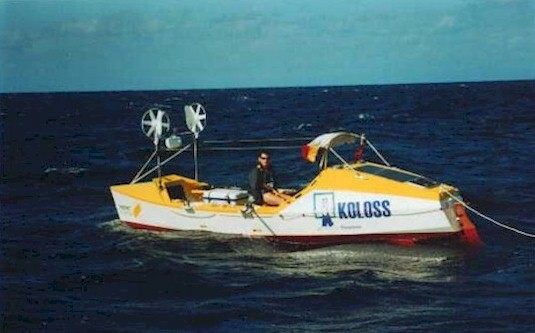 Fastest solo time rowing solo from the Canaries to the West Indies (73days 8hrs). (With special thanks to the Independence Seaport Museum in Philadelphia, Pennsylvania and Sidney's daughter Isabelle).
" The second in History Atlantic Row to Miami"
Eugene Smurgis ... Russian Arctic rower.